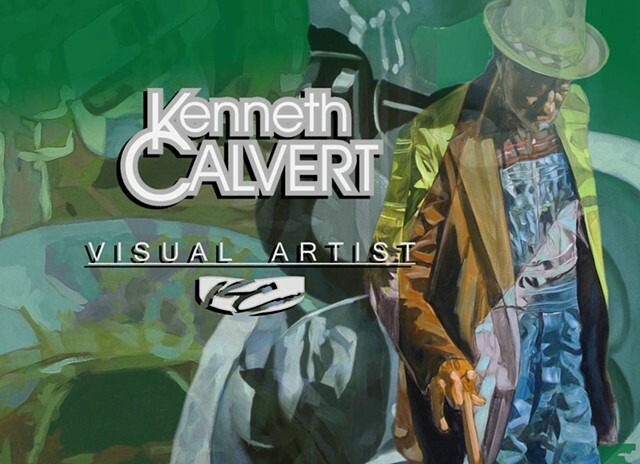 Ken Calvert is an internationally acclaimed artist, skilled as an illustrator, painter, graphic designer and muralist. A resident of St. Louis, he is credited with the cover painting of the Missouri Historical Society publication, “Discovering African American St. Louis”. He has also credited with the "Cornerstones of Courage and Culture" mural, St. Louis City Hall and the "TROSCOM in Action" mural, U.S. Army TACOM. His celebrated painting of Ndumba Tembo, one of the last great Tchokwe leaders, is included in the Anheuser Busch "Great Kings and Queens of Africa," collection. Mr. Calvert is not just a painter, but a profound interpreter of the natural world. Celebration is a word often used to describe Calvert’s work which is full of life, color, and movement. 2000	Commissioned by Anheuser Busch for painting of Chokwe Chief Ndumba Tembo, for the “Great Kings and Queens of Africa Series”.